The Perils of “Deconstruction”- What fate for our environment and health? | Patricia DeMarco Ph.D. The Perils of “Deconstruction”- What fate for our environment and health? We live in a strange time when protecting the environment through government regulations has been demonized as the enemy of jobs and progress. I find this most distressing because I grew up in the height of the Industrial Revolution when the skies of Pittsburgh were dark with smoke. Pollution was an ever-present part of daily life: streetlights were on all day; people wore brimmed hats to keep the ashes off of their faces, and “Ring around the collar” was the lament of housewives. The Monongahela River was so polluted with effluent from steel mills, glass works, coke works and smelters that the water was as acid as vinegar, and practically lifeless. Strip-mined lands were left to leach and drain acid into streams, leaving 3,000 miles of Pennsylvania waterways permanently running orange and lifeless. In 1969, the confluence of several highly publicized events from pollution of air, water and land combined to focus attention on the need to control pollution. Heat inversions trapped emissions close to the ground creating suffocating smog, as in The Smog of Thanksgiving weekend in New York in 1966 and the prevailing conditions in San Diego and Pittsburgh. 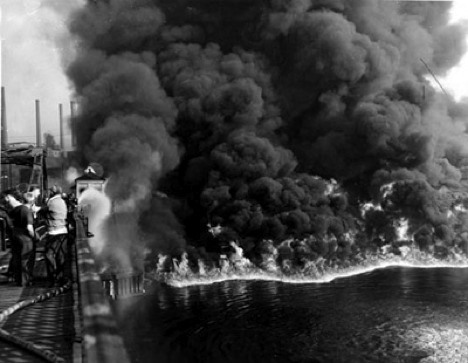 In June 1962, the Cuyahoga River in Cleveland caught fire and burned two bridges when sparks from a train ignited the oil-soaked debris in the river. Such events happened frequently in American rivers in the late fifties through the 1960s. The Santa Barbara Oil spill of January 28, 1969 brought attention to the spills that occurred regularly from tankers running aground, or pipelines rupturing or leaking. The widespread toxic effects of agricultural pesticides like DDT and the way their effects permeated through the food chain came to attention through Rachel Carson’s book Silent Spring. It was the combined impact of all of these perceptions, rolled into the turbulent times of the early 1970s over war protests, women’s rights movement, the civil rights movement and anti-nuclear sentiment over open air testing of nuclear weapons that galvanized protests from 20 million people nationwide on the first Earth Day 1970. 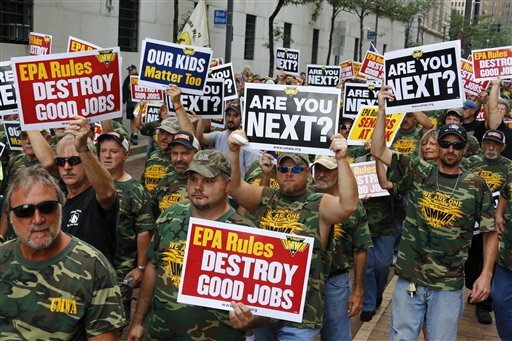 Environmentalists and labor unions worked together and built a broad coalition around clean air and clean water. Congressmen marched with their constituents pledging to make changes, and it was President Nixon who gave the foundations for bipartisan remedy to this recognized crisis. In his 1970 State of the Union speech, Nixon called environmental preservation a “common cause of all the people of this country.” He went on: “It is a cause of particular concern to young Americans, because they more than we will reap the grim consequences of our failure to act on programs which are needed now if we are to prevent disaster later. Clean air, clean water, open spaces—these should once again be the birthright of every American.”[i] The Environmental Protection Agency was established soon after, with the foundations of environmental protection policy enacted into law with bipartisan support: the Endangered Species Act, the Clean Air Act, the Safe Drinking Water Act, the Toxic Substances Control Act. The Environmental Protection Agency was not an attack upon States Rights or a suppression of individual freedom of actions to pursue economic advantage. Federal environmental protections recognized that pollution knows no boundaries. States alone would be unable to address significant problems of air pollution, watershed, river and stream contamination or the ubiquitous dispersion of toxic chemicals throughout the country. National standards and federal enforcement are necessary and fair. Do people know what effect this wanton behavior will have on the health and well-being of American people, workers, communities and natural preserves? How did it become a desirable outcome for coal waste to be dumped into streams? Or volatile toxic releases to be exempt from regulations, as with hydraulic fracturing? Do Americans really want unrestrained mining, drilling and ranching on public lands? Does increased access to wildlife refuges and national parks require that restrictions be lifted on lead ammunition and fishing that poisons thousands of birds and fish? Do workers really want the Risk Management Program that protects workers, first responders and communities from industrial spills and accidents to be eliminated? These actions slip through a Congress in the thrall of a demonic drive to “Make America Great Again” defined by military might alone. Shifting $54 billion from domestic spending to military force buildup while the President irritates allies and aggravates enemies sets the stage for war, not peace and prosperity. Budget is policy. This proposed budget, unrestrained with either mercy or compassion for average working Americans and oblivious to the needs of the future, is a prescription for disaster. In towns, cities, communities across America, people with vision and concern for the future are making plans for a socially equitable and environmentally sustainable society. These efforts will not fall to the greed and corruption perpetrated on the people by a demagogue. All people share our common humanity regardless of divisions in political persuasion, culture, religion or economic status. We all care about the future for our children, and value safe drinking water, fresh air, accessible and safe food, and secure and safe work places. Most people value the national parks and refuges as the legacy of our land. [v] Government budget and investment choice can steer towards processes that make the jobs and industries thrive or collapse. In a budget steering toward military might over a sustainable new economy, with infrastructure plans looking to the past rather than to the future, people are beginning to recognize that the fate of those outside the elite 1% is to serve as cannon fodder. Stand up for the hard-won protections of our life support system- fresh air, clean water, fertile ground and biodiversity of species that constitute the Web of Life, of which we are but one part. America’s greatness lies in leading toward a future that serves all of the people with justice and security, with equal opportunity to thrive and pursue our dreams, and with respect for the resources of our land that support us all. We depart from the hard-won protections of our common resources at our own peril. [i] President Richard M. Nixon. 215 – Special Message to the Congress About Reorganization Plans To Establish the Environmental Protection Agency and the National Oceanic and Atmospheric Administration. July 9, 1970. http://www.presidency.ucsb.edu/ws/index.php?pid=2575&st=environmental+protection+agency&st1 Accessed March 1, 2017. [ii] David Z, Morris. Fortune Magazine, February 25, 2017. http://fortune.com/2017/02/25/bannon-trump-cabinet-cpac/ Accessed February 26, 2017. [iii] President Donald Trump. Address to Joint session of Congress, February 27, 2017. http://www.cnn.com/2017/02/28/politics/donald-trump-speech-transcript-full-text/ Accessed March 1, 2017. Categories: Call to Action | Tags: Budget priorities, EPA, jobs, Resilience, Trump policy | Permalink.